Because I'm quite certain there's no pumpkin in coconut cashews, and also because I'm pretty sure pumpkin seeds do not constitute a pumpkin product, and also because my last 2 posts have been relatively pumpkin-free, and because my wife and I have suffered from severe pumpkin-withdrawal over the last 2 weeks, and finally, because it's Halloween, I have decided that it's high time to take a look at something pumpkintacular once again. It's pumpkin-flavored bread pudding. I remember the first time I heard of bread pudding. I was like, "Wait...you mean it's bread and it's pudding?" I was overjoyed. "What's next?" I thought. "Ice cream and cake? Cookie butter and cocoa spread?" It's kinda like that Ford Fusion commercial where they say "I like 'and' better," which is quite obviously a rip-off of the Old Country Buffet commercial where the people visit "The Land of &." Well, I just visited the Land of Bread and Pudding and Pumpkin, and I'm thinking about transferring my citizenship there. It's pretty awesome. And to add to all of the awesomeness, I must mention that I didn't even turn on the oven to prep this product. I got lazy and used the microwave, even though I've sworn off such barbaric practices in previous posts, even if the instructions list it as a viable heating option. But in this case, it worked pretty well. Our microwave is cheap and old, so it didn't heat completely evenly, but I often wonder if heating the bread pudding in the oven might have dried it out a bit. Ours was crazy moist, like bread pudding's supposed to be. Both Sonia and I agree that it's actually a bit better served at room temperature rather than warm, despite the instructions contradicting us. Because remember, the WG@TJ's crew is always right. The product tastes bready and custardy, and the whole thing has an air of pumpkin pie. It's just solid enough that you can eat it with your hands or out of a napkin, but it's also melt-in-your-mouth soft, and you could theoretically eat it with a spoon. 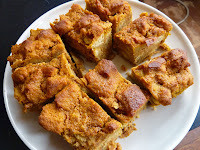 This stuff goes great with coffee, it tastes a good bit like pumpkin, and at least in our case, it stayed moist for the whole 12 hours it lasted on the counter under some saran wrap. Sonia gives it 4.5 stars. I give it 4. I do not make it to TJ's often, but I'm hoping to pick this up next time I'm there. I've actually NEVER had bread pudding before, and given how involved it seems to make, I think this might be a solid way to break in. Thanks for the heads up! You're welcome, Adam. Thanks for reading. Hope you enjoy it as much as we did. Has your wife seen the Pumpkin Body Butter? Oh. My. Word. It is so amazing. Also, I just discovered the Pumpkin Butter. It left me speechless. This looks great - I'll have to pick it up next time I'm there! I did our last TJ's run by myself and I didn't see the body butter—but thanks for the reminder to look for it! Yeah, we reviewed the Pumpkin Butter a year or two ago...glad you liked it! Where do you find this in TJ's??? Looks amazing! It was in the frozen section, Claire. It's pretty good! I made this in the oven. I realized halfway through I was supposed to wrap in foil and it still turned out moist. Good stuff. Good to know! Thanks for sharing your oven experience. Now we know it works both ways. Thanks so much for your kind words, Melissa! That means a lot. Thanks for reading (and watching)! Threw this in the cart on a whim, and now I'm making plans to go buy as many as I can before the season is over. DELISH with fresh whipped cream! That's exactly what I did, Linda! 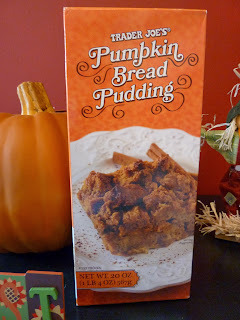 My freezer is now stockpiled with TJ's Pumpkin Bread Pudding!